Justice. The « CONSTABLE RESEARCH B.V.
Ma’at was one of the Egyptian Neteru (a Goddess). She represented the concept of Justice. Just like Lady Justice she carries a scale in her hands. Ma’at was also the keeper of the Afterworld. 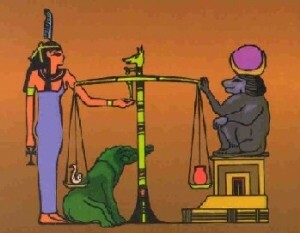 The dead person’s heart was placed on a scale, balanced by the Feather of Ma’at. If the deceased had been found not to have followed the concept of Ma’at during his life (if he had lied or cheated or killed) his heart was devoured by a demon and he died the final death and was reincarnated. If the heart weighed the same as Ma’at, the deceased was allowed to go on to the eternal afterlife. Ma’at was an important Neteru and important Neteru are bisexual. Ma’at was created by Amon (later named Ra, The Sun) and was one of the four bisexual primal forces in the Universe. Ma’at was the Breath of Life. Through Ma’at the Cycle of the Seasons and every other Cycle was moving around. Ma’at represented the Rythm of the Universe. Later the bisexual Neteru were split into a male and a female part. Ma’at became female and her companion was represented by a Baboon. Later the Baboon changed into Thoth, The Scribe. Thoth (or Set) was the creator of language and writing. He was also a very powerfull Magician. Behind the many transformations lies a very important story. It is the story of the Creation of Man. Man was a creation of a Neteru and his creation was a big mistake. His creation was not according to the Plan of Amon. The Plan of Amon was to keep Ma’at, Balance, Rythm and Order. Man was created out of the secret fusion between one of the Neteru (Seth, Thoth, Enlil) and a “Chattering” Baboon. Three times the fusion failed and in the end Enlil decided to destroy his creations by the Great Flood. The Fusions between Ape and God was creating a gigantic cosmic Unbalance. One of the Talking Baboons (Atrahasis, Noach) and all the (not-talking) Organisms were saved by the intervention of one of the other male Neteru (Enki, The Wise, The Water God). The Words of the Organisms (Seeds, DNA?) were put into a boat (The Ark). To keep the overpopulation of Humans in balance a System of Cycles of Creation and Destruction was created. On the level of the Soul Man is a bisexual being. The Soul is incarnated in a Male and a Female body until he is able to leave the Cycle. He is able to leave the Cycle when his heart weights the same as the Feather of Ma’at. All he has to do is to live a life of Justice. He has to act out of the Heart. A Human is capable of Injustice because he carries the “genes” of one of the male Neteru who stood up against Amon. If his heart is Heavy Like a Stone he is taken over by the Demon and has to return to the Material World to try again and again until he has learned his lesson (Reincarnation). The Demon has many tricks to keep the Soul into the material plane. His most important trick is Language. Ancient Egyptian law dates from 3000 BC. It was based on the concept of Ma’at, rhetorical speech, social equality and impartiality. Around the 2200 BC the first law code based on casuistic statements (“if… then…”) was developed in Persia. Around 1760 BC, King Hammurabi further developed Babylonian law by codifying and inscribing it in stone. About 5000 years later many people believe the Ancient people were barbaric. Objective Law and its Institutions are one of the beautifull inventions of Western Culture. Western Culture was a product of the old Greek Civilizations. The Romans perfected the System of Law. Almost nobody knows that the old Creek Scientists copied all their knowlegde out of Egypt. The Greeks named the concept of Ma’at, Logos. The early Christians adopted this concept as you can see in the first line of the Gospel of John (“In the beginning was the Logos ,and the Logos was with God”). In the Gnostic Tradition of Christianity Ma’at was called Sophia (Wisdom). The effect of the Gene of the deficient Neter later called the Devil has increased in Time. The split of the Male and the Female part resulted in a Male Dominance in every area part of Society. The Afterworld changed into an Underworld. The Power of the Heart has diminished. The concept of Ma’at has lost his place. Ma’at has been blinded and her Feather has changed into a Sword. The amount of Rules has increased tremendously. The Chattering Baboon has produced many Words of Justice. The Talking Baboon has taken over the Power. His Words have finally killed Amon. Ma’at is not needed anymore. The Baboons are able to Stear the Stars themselves. Nobody knows that we are still silently governed by Ma’at. We have to move to the Dark Cycle to restore the Golden Age of the Gods. In the Golden Age the Light of Amon (The Sun) will Shine Again. Truth, Integrity, Honesty, Goodness and Balance brings one closer to the spiritual essence that is all pervasive in the Universe. There was nothing more sacred or important to the practitioner of the Ancient Egyptian Religion. The cosmic order that is Ma’at connects everything in the ageless dance of beauty and motion giving meaning to existence on all levels.